Another Heston movie that was released on Blu-Ray this week. Post apocalyptic tale of an Earth in turmoil in 2022. All natural food sources are extinct. People must live on water rations and a mysterious food called soylent. 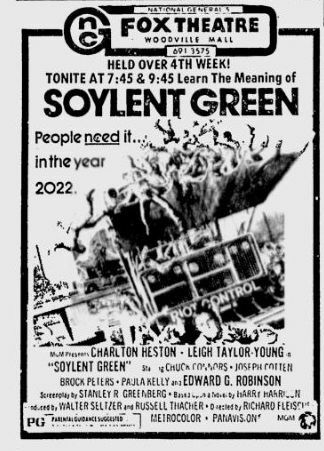 A detective (Heston) investigates the murder of the President of the company that makes soylent and discovers the food's terrifying secret.